The first side has an anti-slip coating (the Grip side) covered with spots made using an Endupack manufacturing process. The spots on this side provide the anti-slip effect. The advantage of these spots is their strong power to prevent slipping without damaging the palletised product above. Stick’N Grip can be used on all types of material: its adhesive is strong enough to bind to wood, cardboard, plastic and metal, among others. 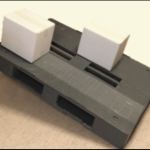 The strength of this adhesive can also be modified for special applications. The glue is not transferred to the surface and the anti-slip effect is not impaired over time. 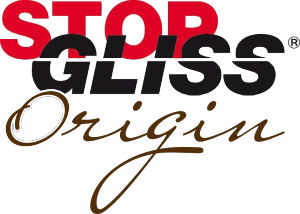 Stick’N Grip can be sold in the form of rolls (of variable width and length) or in the form of sheets in the shape required by the customer. On a plastic pallet, cartons or boxes tend to slide, as from a low tilt angle (<10°). Stick’N Grip can be glued to the plastic pallet, in strips, in certain areas, or as a complete covering. The palletised loads above remain immobile up to a tilt angle of about 40° (the angle varying according to the type of surface in contact and the weight of the carton). One strip of Stick’N Grip is placed on the plastic pallet. Two cartons are placed side by side on the pallet. One is on the strip of Stick’N Grip, the other directly on the plastic pallet. 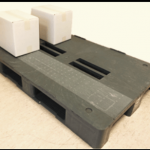 The pallet is tilted to about 15° and slippage of the carton in direct contact with the plastic pallet can already be observed. 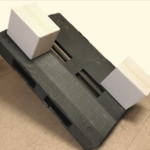 Once slippage of the carton in direct contact with the pallet is complete, the pallet is raised to observe the behaviour of the carton placed on the strip of Stick’N Grip. At an angle of around 35°, it does not move and is retained on the plastic pallet. 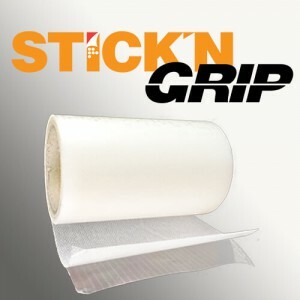 To reduce sliding of objects in a car or boat in motion, Stick’N Grip can be used to cover shelves and the dashboard, to prevent objects from slipping or falling. To prevent movement of a piece of furniture on a slippery floor surface (tiles, parquet…), Stick’N Grip can be used on the floor or on the furniture itself, to avoid this inconvenience. This list of examples is not exhaustive. Stick’N Grip can be used in many different fields, both in industry and for the final consumer.